•The Purple Line Extension will directly connect downtown Los Angeles to Westwood via the Wilshire Corridor with a short detour to Century City. The project also provides a direct link between our region’s largest transit hub — Los Angeles Union Station — and the Westside. •The Expo Line’s second phase connects Santa Monica, West L.A. and downtown L.A. via Culver City, the northern part of South L.A. and Exposition Park. •The Gold Line Foothill Extension extends the Gold Line to the Azusa/Glendora border, making for easier and faster access to jobs in the Pasadena area, downtown L.A. and beyond (i.e. the Westside). Meanwhile, the second phase of the Eastside Gold Line is being studied and would connect either South El Monte or Whittier to downtown L.A. via this project and the Regional Connector. •The map also suggests that connecting the San Fernando Valley to the Westside via the Sepulveda Pass Transit Corridor makes sense and that the area along Van Nuys Boulevard — to be served by the East San Fernando Transit Corridor — is also a wise proposition in the short-term. The Sepulveda Pass Transit Corridor is a long-term project not scheduled for completion until the 2030s unless funding is found to build and accelerate it, but the project could eventually connect to the bus rapid transit or light rail built as part of the East San Fernando Valley Transit project along Van Nuys Boulevard. •The map also shows that the Warner Center area is one of the more job rich areas in the Valley, thereby suggesting that it makes sense for Metro to pursue improvements to the Orange Line. See this recent Source post for more about that. A good look at the most recent plans to tear down the existing bridge over the Los Angeles River and replace it with something a lot more pedestrian, bike and open space friendly (under or adjacent to the new bridge) by 2019. While the downtown L.A. side of the bridge has been getting a lot of internet attention, Streetsblog smartly considers the eastern side, which doesn’t quite make it to Boyle Heights proper. Also, take a gander at the comments where it’s wisely noted that road projects are every bit as pricey as transit projects. The website’s “Ask Umbra” feature considers a reader question: which is greener, HOV lanes or HOT lanes (i.e. congestion pricing lanes such as Metro’s ExpressLanes)? Umbra’s conclusion: there are many factors and it’s hard to say which is better — but that HOV and HOT lanes together are part of a larger strategy to offer more mobility options and reduce greenhouse gas emissions. Lots of good nuance here usually missing from media reports on congestion pricing. One note: Umbra does discuss the issue of equity; Metro does offer qualified low-income users a $25 toll credit when setting up an ExpressLanes account. The newspaper asks Metrolink if they will ever expand service to Victorville and the short answer is: no plans are in the works. Funding is one issue, securing space on busy freight tracks is another. Perhaps something to consider for those moving to Victor Valley, or perhaps something residents who want rail should have considered before moving to the high desert. The crowdsourced navigation app wants to share more of its real-time traffic data with local governments while, in turn, using more government traffic alerts to better refine its driving maps. The firm recently announced plans to set up such agreements with cities/metro areas including New York, L.A., Boston and Rio de Janeiro, to name a few. Quasi-related: Google is now using cameras mounted on hikers to capture images of trails in the California State Parks system for its Google Maps applications, reports the L.A. Times. Hmmm. Looking forward to going home from work, popping open a few beverages and virtual hiking some park I’ve never visited in person. Metro, look at that map carefully – see all those yellow and red areas? THAT’S where you should built more high capacity, fast and reliable rail lines that do not have to compete with traffic. Concentrate on areas with the most jobs and residents, and stop building rail lines out towards San Bernardino, where ridership will be embarrassingly low. I agree Metro should stop expanding Metro beyond our LA County lines. LA County is big enough it is and we already have lines that nudge into Ventura and Orange Counties, at the expense of LA County taxpayers. We already have one person here who isn’t an LA County taxpayer taking advantage of a cheap ride all the way from Orange County to Disney Hall. By law Metro cannot build beyond the limits of Los Angeles County. If the Foothill Light Rail Line is built east of Claremont to Montclair or ONT airport, it will have to be built and funded by San Bernardino County’s SANBAG, who will also have to pay Metro for the operation of trains east of the county line. What the diagram doesn’t show is what types of jobs there are and where the people who goes to those types of jobs actually live. There’s a big difference between the white collar office worker living in a home in the suburbs and working in LA office buildings versus a McDonald’s worker making minimum wage who lives less in an apartment less than five blocks away. Nice map, but how is it different from a population density or job density map? Put differently, how can we use the map to infer the effects of transit? The map shows a combination of the employment density and the availability of transit service. That is why you see some areas that are orange even though they have relatively low density development, such as the area around the I-110/Slauson interchange. Basically the map shows where someone should want to live if they only care about being close to transit that will get them to a large number of jobs sites. The colors in the map will change (become more red) as new high-speed transit lines are built. In order to “use the map to infer the effects of transit” we need to compare this “accessibility to jobs” map to a map of population density. Areas with relatively high population density that have low accessibility to jobs (blue or green on this map) should be considered for improved transit service. 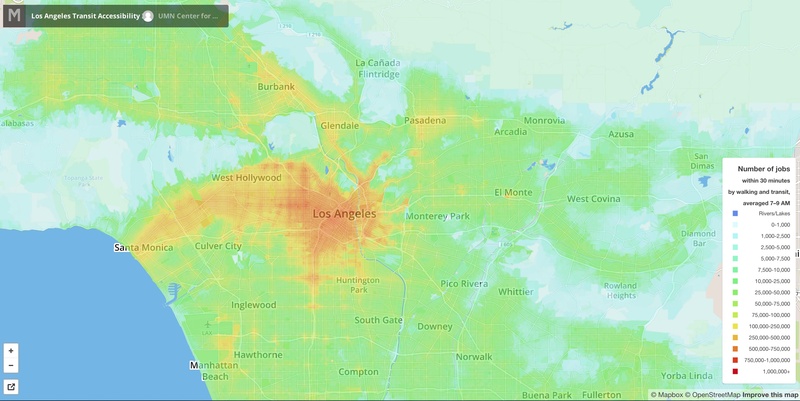 It’s worth noting that the map still confirms that LA punches below its weight on transit. 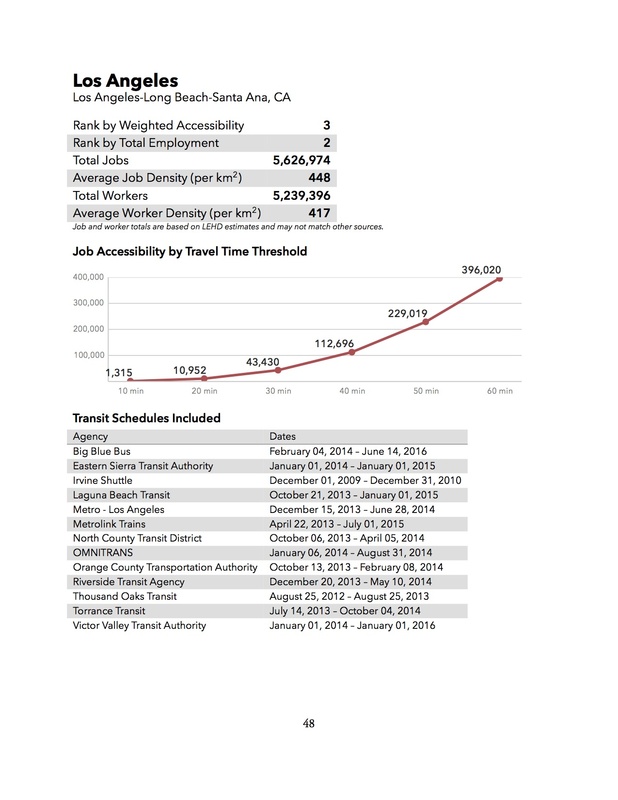 LA’s number 2 on total jobs but number three on transit accessible jobs. More work needed, and I really hope that, on top of the Measure R system, some more BRT and some new rail lines focused on connecting people and jobs are made priorities (which is why northern extensions of Crenshaw and Green to Hollywood and Santa Monica should be part of R2, as should building both branches of Eastside Phase 2 and making sure the Valley is properly connected to the Westside). It will greatly improve social mobility and quality of life if people struggling to get by don’t feel like they have to choose between thousands of dollars a year for a car or a 90 minute bus commute to jobs-rich areas like the Westside. It’s also why the County should seriously consider transit-oriented affordable housing funding as part of R2 or perhaps a separate general obligation bond. LA currently has unsustainable housing patterns that separate better-paying jobs (on the Westside) from the people who need them most (in South and East LA, the Gateway Cities, and further afield in the AV and IE). Some serious affordable housing investment could go a long way, especially if Metro tries other things like conditioning part of local return funding on adopting appropriate TOD land use policies so we don’t end up with bungalows inhabited by millionaires next to a multi-billion dollar rail line (see: Expo Phase 2). Of course, getting people to and from work is only part of public transportation’s job. There’s also getting people — both locals and tourists — to and from leisure-time activities. I can’t take Metro to work — I live in Fountain Valley, and work in Costa Mesa — and neither can I take it to my organ lesson on Saturday mornings, or to my weekly docent shift at the International Printing Museum, after my lesson, but when I go to Disney Hall or the Bowl, I take Metro. When I go to the museums of Exposition Park, or of Hancock Park, I take Metro. When I visit the Watts Towers, or the Museum of Tolerance, or even the Flight Path aviation museum at LAX (a fairly long walk from the Green Line), I take Metro. When I’m vacationing in San Francisco, I practically live on the MUNI. In Chicago, the “L.” In Boston, the “T,” in New Orleans, NORTA, and in Philadelphia, SEPTA. In those cities (not to mention New York), if I can’t get someplace directly by public transit, and it’s not good enough to be worth the shoeleather to walk there from the nearest transit stop, I’m probably better of not going there at all. This is the problem that Metro faces: it’s being used by people out of our county and they take advantage of our cheap rides that are paid for by taxpayers of our county. If you live in Orange County and you use Metro to go such a long distance to venues in LA County. I wonder why? That’s right, because you only pay $1.75 to get here. You clearly deserve to pay a higher fare for such a long trip. Why should LA County residents have to subsidize your ride for an Orange County resident who doesn’t even pay LA County taxes? And I really hope that the orange rail conversion gets killed. Metro, at the Board’s direction, is studying NoHo to Pas BRT. We’ll see what happens. The portrait paints only half the answers because it only shows where the jobs are, but doesn’t really show where people live in relation to these jobs and how people commute. Yes, I know it’s creepy that Google is doing this, but Google has all the data that Metro is looking for in transit planning. It’ll show you a detailed analysis of where and how people do their daily commutes as well as their daily routines relative to the location of their home and their work. Using this data, Metro can analyze to find where the most traveled “routes” are that are done today by cars which can be replaced with mass transit. And it’ll also show Metro how far each Android user travels at any particular moment to come up with a better fare pricing scheme. Data is important and Google is the one that has them. People don’t like being data tracked, but Google’s massive collection of location history data could be put to better use by Metro for mass transit planning. There’s also a lot of census data available in GIS products that show key corridors. Strongly suggests that Vermont corridor is underserved by Metro, and probably needs a BRT line and investment in better bus stop facilities. As someone who rides the 754/204 about 30-35 times a week on average, I couldn’t agree more. When I get on a 754 and every part of my body isn’t squished up against someone else’s, I feel like I might have hopped on the wrong bus in a tired, early-morning stupor. It’s also possible to gather up state tax data for Angelenos because all the W-2s that are sent out to everyone notes where each taxpayer lives and where they work. Compile a list of how far it is between the two places and you get an average distance of how much a person travels to commute relative to their income. Using Census data, W-2 data, as well as Google location history data would give a treasure chest of info for Metro that can be done to better plan key transit corridors as well as help in the assessment for a better fare structure. Metro needs the missing data from the above UMN study, namely the perpetually ignored and underserved South Bay. The map barely shows El Segundo – what about the Torrance to Long Beach employment centers? SoCal mobility from home to non-local jobs is still screwed until public transit phobic Orange County gets on board. That’s basically why Metro’s looking into extending the Green Line south, although I understand funding is constrained. Yeah, in LA transit is near jobs but unfortunately people aren’t near transit. This map is another example of bad data being used by people (in Minnesota) with no context or local understanding. See that curve of green through Rowland Heights? A lot of the “transit service” there is either the Metrolink RIverside LIine or Foothill Transit buses that run at peak times, in the peak direction only. Want to get to these places outside of M-F 9-5 or from any place but Riverside or Pomona? Enjoy the pokey local bus! The data map at the UM site reveals some interesting details upon close examination. It would appear the location at the southeast corner of Alameda Street and Cesar Chavez Avenue rates the highest in all of Los Angeles for number of jobs within 30 minutes by transit or by walking from 7 am to 9 am. 750,000 to 1.000.000 jobs! Jobs are plentiful, but getting to those jobs are the problem. Everyone lives farther away from work due to zoning laws which discourages high rise residential structures being built near commercial properties and vice-versa. Zoning laws in LA were made in 1947 when there were far fewer people living here, land was plentiful, gas was cheap and commuting by cars were the wave of the future. The effects of those city planning efforts back in the day ended up encouraging suburban sprawl. They’re doing recodeLA to revise our zoning laws, but those won’t take effect until 2017 and it’ll take a lot more than revising our zoning laws to fix our problems that the past generation has caused.